Hello friends, it has been a little while since I finished up my first Dungeon Map Tiles set and I thought it was about time to make another one with a different look and feel to it. 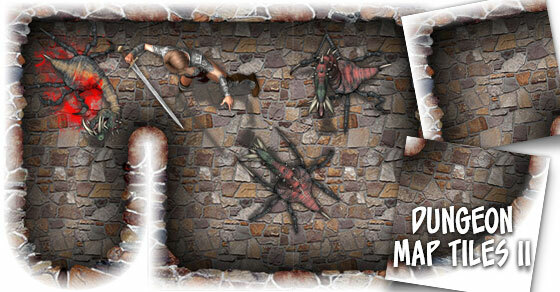 So here is Dungeon Map Tiles II. This set has a darker look to it that the first. Just like the first set, I'll be releasing a series of small "pre-production" packs as I get each stage in production completed. These small packs will be available in the Studio Store. Once I get the set to a point I am happy with, I'll wrap the whole lot up and pop it on RPGnow.com. One interesting thing I am thinking about doing, is making a bunch of "ready-made" rooms with pre-set objects and lighting that DM's can just drag-n-drop into their maps. Looks good. For me it would also be nice if you or someone could do a step by step tutorial to using these in something like GIMP. I know in the past everyone has said oh its just drag and drop. But drag from what and drop in what? When I drop something into GIMP it fills the whole screen; which isn't what you want. It's just that you might sell more if people like me who are not artists knew that there was simple way to use the tiles. PS, from experience I never believe the phrase "quickly and easily". When you drop it into GIMP, it uses the original size. I forgot exactly what scale he uses for his tiles, but if it's say 50x50, then figure out how big you want your map in tiles wide and tiles high, multiply both of these by 50, then create a new image using those dimension. Create a grid that is 50 high and 50 wide. Turn on "snap to grid". Then just drag tiles from a file explorer window onto GIMP, and move them into place on the grid. With "snap to grid" turned on, the tiles should line up with very little effort on your part - just drag them into pretty close and it will "snap" into place when you drop the tile. All of my stuff uses a scale of 180 pixels to a 5ft character square. So all the map tiles are 180 pixel squares (except for the larger ones that are multiple squares combined). But I also provide the tiles as 50 pixel squares as well. Ah, thank you Andraax. That does indeed seem to come into the category of 'quickly and easily'. I think I'll just toddle along and have a go at that. Cheers! I never could get gimp to work right with these either but Tiled works really well with them. 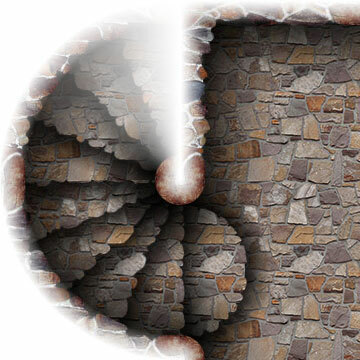 here is a quick sample of the circular steps in action. 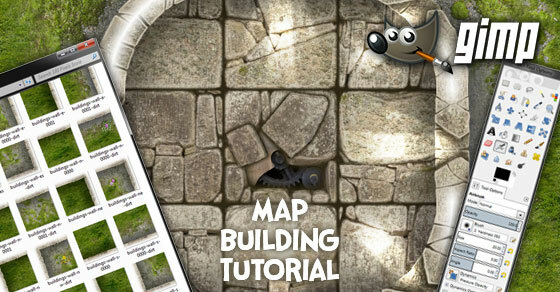 A couple of people have asked for a tutorial about how to use GIMP and the Dungeon Map tiles. So I have scratched together a tutorial that gives you the basics about how to do just that.